Finally on grips, consider adding in overhooks and underhooks, especially in nogi. If you can reach your same side hand under their armpit and around their back, you can lock it to your other hand to clamp in tight on the shoulder. That presents you with opportunities for pressing armbars and omoplatas, or butterfly sweeps if you move into open guard from there. Teaching & Sparring Notes: I think the sweep went ok. I can remember Donal showing a combination with the windscreen wiper, which would be worth reviewing next time. That handily means you have a grip on their sleeve, lending itself to various attacks. Which brings me to sparring. I keep not controlling that arm properly before trying at sweeps, which unsurprisingly means they can base and stop the motion. I also didn't lock in the shoulder clamp right, as they were able to pull their arm out (I did try the forearm clasp, but possibly too late). My back take attempts were poor. I had the arm across, I had a grip around the back secured under the armpit, so should have managed to finish that. On the plus side, passing went comparatively well. I went for the 'eat the belt' pass and eventually got it, though grabbing the trousers is definitely superior. With the belt there is just too much room. I sort of managed the Sao Paulo pass variation Margarida shows on his DVD, though only against a less experienced partner. When I tried it on someone who had been training longer, I couldn't get my base right, they were able to easily knock me off balance (I still managed to stay in position, but with a blue or higher, I'm sure I would have been in trouble with that posture). 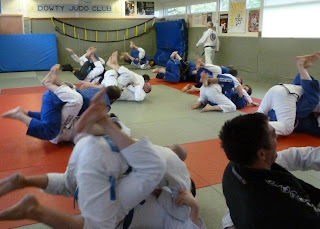 Can, yesterday (06/01) we did a drill related to the sit up sweep, where from closed gaurd we do the sit up, reach over and hip bump, back down and then do the same the other side. I'm not sure that drill was used in this lesson? (04/01) but I wanted to say that for me it was a really effective drill and had I done that as the first thing in regards to learning the sweep I probably wouldn't have found such difficulty in getting up on my hand and leg, haha! Plus that drill was an obscene abs work out, like extreme sit ups!